Only a month or so after Christmas, the socks for my brother are done. These are the first socks I have knit for someone without having their foot to try on along the way. I’m still not sure they will fit him because we haven’t seen each other since they’ve (finally) been washed and blocked. These are pretty much the most basic sock you could make. 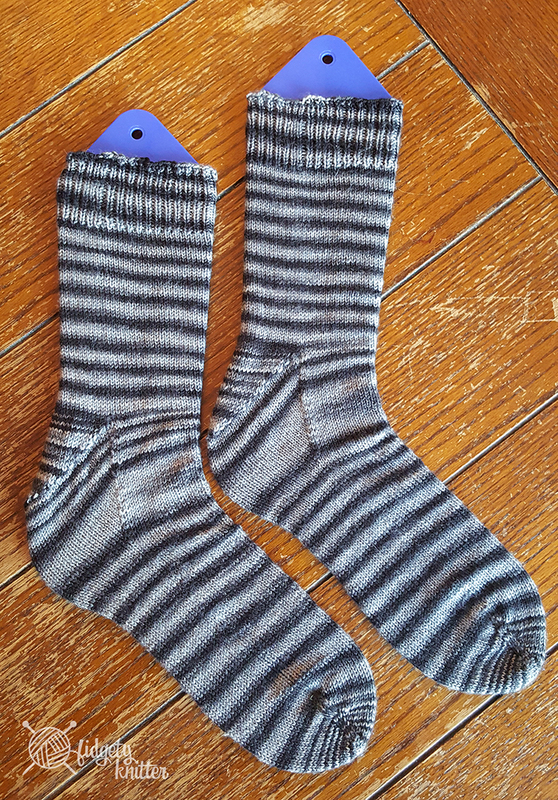 I used my go-to pattern for two-at-a-time on magic loop toe-up socks, Beginner Toe Up Socks for Magic Loop. This pattern is super-simple and makes a really lovely sock. Sometime I might try top-down, but I’m not ready to mess with perfection just yet. The toe is cast on with Judy’s Magic Cast-On. While the end result is beautiful and seamless, I find this to be a tricky enough cast on that I need to use a video every time. 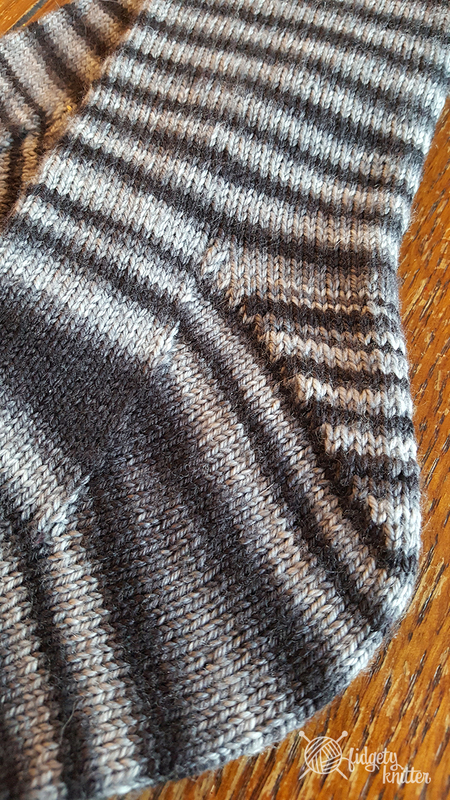 The heel is a Fleegle Heel and is super simple. I do have to watch my count. There have been times where I think the heels have been off one stitch on one side or the other. I’m pretty sure that is user error, though. 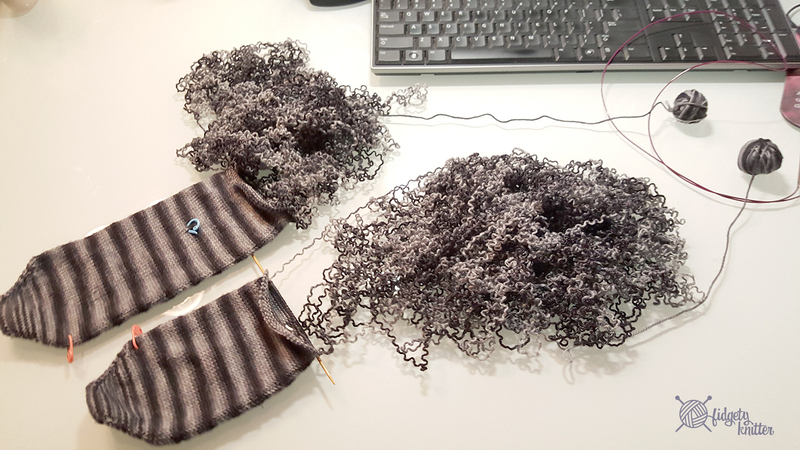 To make sure I pay attention to the heel, I always turn the heel when I know I can sit down and do one whole heel at a time without needing to set the work down. To bind off, I use the fancily-named K1, K2tog-tbl Bindoff. I really love this bind off. It’s very stretchy and adds a beautiful braid finish to my projects. It does tend to curl out, though, so it’s not a hidden bind off by any means. However, as the finish to a sock cuff, it’s stretched out when you wear it so you can’t tell it curls. Hopefully what you’ve REALLY noticed in these pictures, though, is this amazing yarn from Three Irish Girls Yarns. This colorway is called “Smoke on the Water” in the adorn sock weight and what you may not be able to tell in these pictures is that it doesn’t jog at the changing of the stripes. 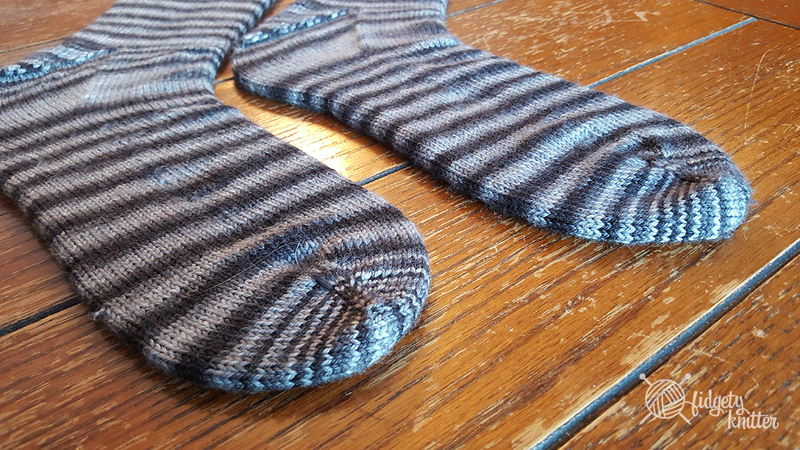 Instead, the stripes spiral around the socks. A friend tried to explain to me that it has to do with the length of the color runs and how it works out on my sock. I think she mentioned something about parking meters. Really, I think this is just magic. This yarn is amazing to work with. Made of 80% merino/20% nylon, it doesn’t split or untwist and I didn’t encounter any knots (I knit these from opposite ends of the same ball). I’m not sure how these will wear, but they are smooth and soft and feel very nice on my feet (obviously you try on the stuff you knit for other people as you progress along, right? Except maybe baby things. Unless you’re a baby who knits, which would be pretty cool to see). 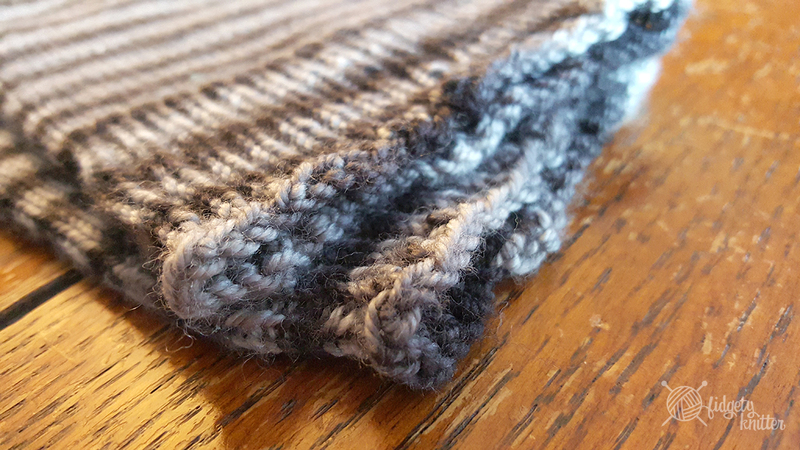 Picking those itty-bitty stitches was easy to do (they didn’t slip down as I put them on a needle), the yarn didn’t split and even more important, there was no pilling or fuzziness as I reknit yarn that had just been knit. When I purchased this yarn, of course I may have picked up another hank of Three Irish Girls Yarn to make socks for myself. Originally, that idea was further down the list. I may now have to reconsider. Based on this (to be honest, not cheap) purchase, I am a big fan of their work and will be purchasing more Three Irish Girls yarn in the future. What’s your favorite yarn right now? Let me know in the comments and be sure to include links! Ha ha! I hoped you’d see that! I’m loving that striping grey effect! I have more of a sentimental reason for my favorite yarn at the moment–a few months ago I was generously gifted a variety of worsted scrap yarns from fellow ravelers and it’s been an absolute treat to see it become a part of my massive scrap-ghan project.